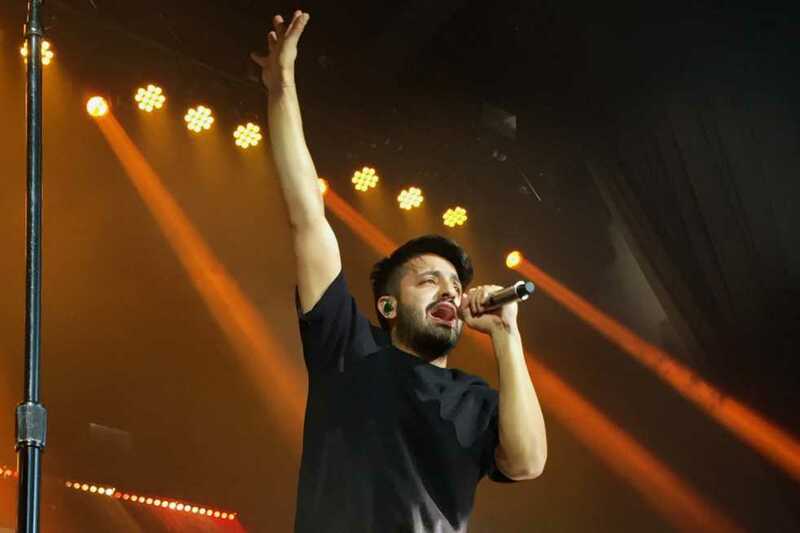 The Coca-Cola Roxy concert hall was teeming with energy as people gathered to watch indie rock band Young the Giant perform. It was the Saturday night before Halloween, which was made obvious by the concert-goers clad in costumes. The air was heavy with the aroma of woody incense and anticipation as the audience in the sold-out venue awaited the commencement of the band’s performance. Finally, at ten minutes after nine o’clock, the lights in the concert hall dimmed, and the audience erupted with shrieks of excitement as the five members of Young the Giant appeared onstage. The stage was awash with purple light as the band opened with their song “Mirror Master,” the twelfth track on their newest album of the same name. With their trendy, eclectic image and a sound that can go from dreamy to danceable, it’s no wonder why Young the Giant has claimed the hearts of countless fans. Young the Giant’s concert was an hour and a half-long journey that explored tracks from “Mirror Master,” the band’s newest album that was released on October 12, as well as older favorites like “Cough Syrup” and “Silvertongue.” The beauty of Young the Giant’s music lies in the diversity of their song styles. Their songs range from vibrant and electrifying, bolstered by dynamic percussion and snappy guitar solos, to soulful and chill-inducing, lush with satiny falsetto and synth-produced bells. In addition to performing the original versions of their music, the band also played two songs in a style they dubbed “In the Open” in which guitarists Jacob Tilley and Eric Cannata traded in their electric guitars for acoustic ones. When their music was stripped of its synth tones and electric guitar chords, the audience could experience the full effect of the raw emotion behind the songs’ lyrics. Aside from their music, what attracts people to Young the Giant is their sense of freedom, their undeniable passion for performing and the gratitude they express to their fans. From lead singer Sameer Gadhia’s spontaneous, carefree dancing to the music’s spacey, psychedelic sound, the band’s unwillingness to fulfill societal expectations is apparent. In between songs, Gadhia explained to the audience how the band is “embracing [their] versions of [themselves]” and how “[they didn’t] want to be put into a box and made to be something [they’re] not,” which ties into the meaning behind the album “Mirror Master.” The album delves into how individuals are often influenced by other people’s opinions of them, but ultimately, we are the ones who are in control of how we view ourselves. Gadhia preaches the message “Only you are the master of what comes next” in the hope of liberating people from the confines of society. The passion expressed by Young the Giant while they performed made it impossible to look away. Their enthusiasm was everywhere: painted across their faces, echoed by the cheers of the audience and living within the music. Although the band’s music is already exceptional, hearing it live made it exponentially better. What elevated the excellence of the songs was having the ability to witness the group’s emotion with every lyric sung and note played. Young the Giant performed in such a way that made one feel wholly present in the moment; it was as if nothing else mattered but being a witness to the music and sharing the experience with people who were ablaze with an identical fervor for it. Much to the audience’s disappointment, at 20 minutes to eleven o’clock, Gadhia announced that the band was about to play their final song of the night. Young the Giant concluded their concert with one of their first-ever singles, “My Body”, which the crowd sang along to without missing a word. As the song ended, Gadhia looked skyward with his eyes closed as if he were reflecting upon how fortunate he was to be in his position: to be able to live his dream, express his passion and spread a positive message. He was also incredibly vocal about his gratitude, which he conveyed by thanking the audience numerous times. After the show, the band members tossed drumsticks and other items into the audience. Young the Giant’s concert was stellar not only because of the music, but because the members are outstanding performers who know how to captivate an audience. Although the backdrop was simply a grid of equally-spaced lights, the luminous effects contributed perfectly to the band’s style of music. Aside from the phenomenal sound of the group’s new album “Mirror Master,” it also comes with the message of being one’s own person and not conforming to society’s expectations. Overall, Young the Giant provided their audience with a show that did not disappoint.